What is an Ancient Artifact? When you think of an ancient artifact, what do you think of? I think of old rocks, ancient hieroglyphics, cave paintings and so many other things. 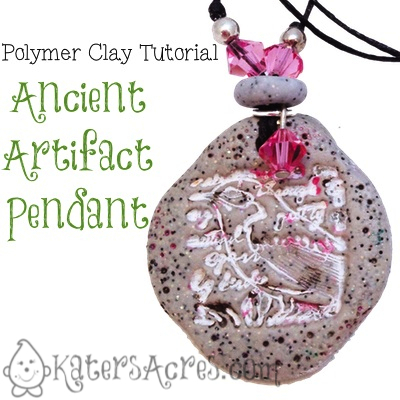 So, how about we try to recreate a little bit of that with a faux rock type pendant with this polymer clay tutorial. Let’s get started! NOTE: You can alter the color if you wish. I added white to mine to lighten the rock, but I did not blend it all the way so that it appeared striated. Cut apart the sheet and form “organic” looking lumps to be shaped into pendants that resemble rocks. DON’T FORGET: These are supposed to resemble ancient relics, so they will have cracks, crevices, tears, dents and lots of cool parts. NOTE: You can shape loosely if you’d like and then after stamping the image form the clay into your desired shape. Pick a stamp that you like, I chose an inkadinkado inchie stamp. If you would like, you can accent the high points with mica powder, using your finger. NOTE: Rub the tip of your finger in the lid of the jar and accent the high points. On any unstamped surface, make all kinds of texture using needle tools, straight pins, steel wool … whatever you have that will make an impression … be creative, but the more accents & details, the better. Use a needle tool to make a hole in the top of the pendant to place the waxed cotton cording through later. Bake your pendant at 275 degrees Fahrenheit for 30 minutes. Once the pendant has cooled use this tutorial to antique your piece. Use another 2-3 colors on specific portions of your pendant to give it an even more aged look. On the pendant above: I covered the entire pendant in white acrylic paint, then I used dark brown on the edges, then I accented 3 portions of the pendant (far left, right middle, right bottom) with pink acrylic paint. I finished by adding a blue acrylic paint to the very outer edges. Once your pendant is fully antiqued to your liking, add a coat of varnish. NOTE: For this necklace, because you want it to look like a rock, use a matte varnish. Place it back in a 200 degree Fahrenheit oven for 10 minutes. Your pendant is now finished. Add a cord (waxed cotton looks smashing for this type of pendant) and even a Swarovski Crystal for a touch of bling. If you have extra clay after making your pendants, make some little beads to go on the end of your cording once your necklace is finished. Bake these beads when you bake your pendants the first time. Thanks for joining me today, be sure to post links to your creations made from this tutorial in the comments section below.